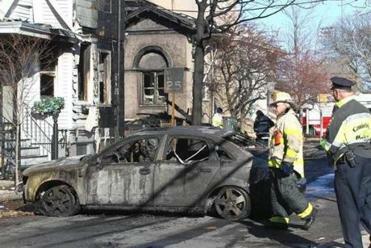 CAMBRIDGE — A Bangladeshi family stood behind yellow tape Sunday afternoon, weeping in silence as they watched crews working on Berkshire Street around the fire-damaged building that they used to call their home. Their clothes, immigration documents, the gold that was their life savings — a 10-alarm fire had taken it all. “All the things I brought from my country — all gone,” Sahida Akter said, crying. She had been standing late into the night, staring as her building burned, and she was back again Sunday morning. She was very tired. As of Sunday evening, authorities had not yet released the cause of the fast-moving blaze that began Saturday shortly before 3 p.m. and displaced more than 100 people. Fire officials said the blaze was contained, though not under control, by 8 p.m. Saturday. Neighbors reported seeing flames as late as 3 a.m. Sunday. The fire damaged 15 buildings, three badly enough that they must be razed, Cambridge police spokesman Jeremy Warnick said. Five to six people suffered minor injuries, including a Cambridge police officer and a firefighter who were treated at the scene, officials said. Despite the goodwill of well-wishers who dropped off food, clothing, or other supplies, the city asks only for cash donations. Authorities were first alerted to the fire at a three-story house on Berkshire Street, which was undergoing renovations, as strong winds quickly turned it into a 10-alarm blaze, Reardon said. 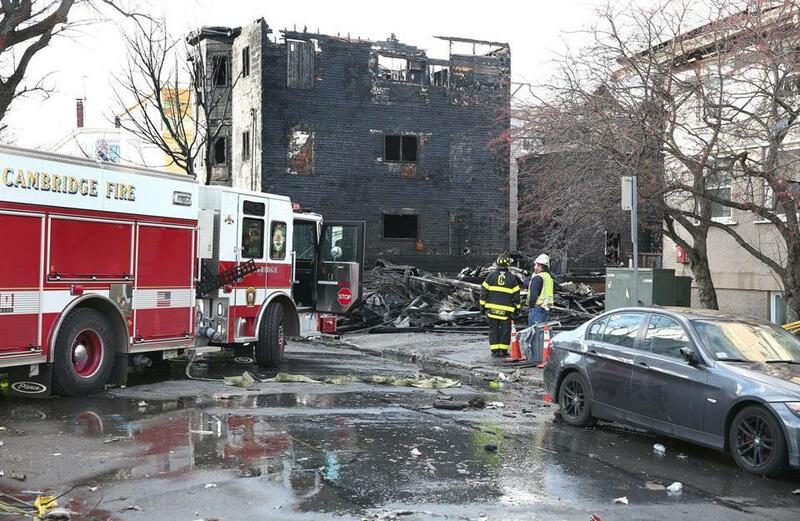 Though there were no deaths or serious injuries — which Cambridge Fire Chief Gerald Reardon called “miraculous” — the fire displaced 48 families, totaling 104 people, according to Neal Alpert, chief of staff to Cambridge Mayor E. Denise Simmons. “This looks almost like a third-world country after a bombing,” Reardon said at a press conference Saturday night. Sahida Akter lived with her husband, Mohammed Badsha Bepari, and their three children at St. Patrick’s Place, a former church on Berkshire Street that had been converted to affordable housing and was near the home that was undergoing renovations. The building housed primarily immigrant families who largely did not have renters’ insurance, said Malika Rushdan, director of the Massachusetts chapter of the Islamic Circle of North America Relief, a Muslim nonprofit that offers disaster relief among other social services. 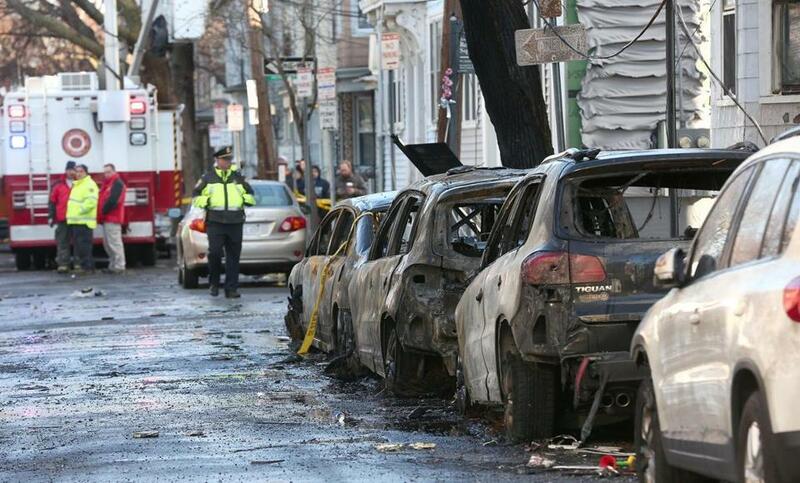 Charred vehicles lined Berkshire Street on Sunday. The Bepari-Akter family is staying at the Holiday Inn Express in Cambridge. Rushdan said she knows of 17 displaced people staying at that hotel, plus at least another six at Le Méridien Cambridge-MIT and two at the Boston Marriott Cambridge. None of the 80 beds set up at a makeshift shelter in the Cambridge Rindge and Latin School were used, Hall said. However, the community is far from finished. Deborah DuPont and Vanessa Ribeiro grew up in the neighborhood and remained friends after they moved to other nearby communities. They came back to Cambridge Saturday night to see the destruction the blaze was wreaking on their old neighborhood and to help move people to shelters. They returned Sunday morning feeling a duty to offer more help. The two women saw the Bepari-Akter family standing on the sidewalk and introduced themselves, hugging the crying family members, giving them three bags of toiletries. DuPont and Ribeiro quickly began asking questions and jotting notes on their cellphones: food preferences, clothing sizes, what toys the children liked. Ali Mohammad lost his house at 28 Berkshire St. in the blaze, along with his car, but remained upbeat. He is Iraqi — born in Baghdad before coming to the United States in 1986 — and has lost family members. Rushdan said a family from Framingham is donating a car to Mohammad and his family. He has a 4-month-old baby. A small crowd gathered Sunday morning at the corner of Berkshire and Plymouth streets, observing the damage. “It’ll be a demolition scene for a couple of weeks,” one man said. A burned sedan leaked fluid onto the street as officials used a forklift to place it atop a truck. Other cars parked on the street had been damaged, including shattered windows. Meanwhile, residents combed the area for missing pets. Cate Johnston searched anxiously outside for Pucha, a cat who “only speaks Spanish,” that she got while living in Honduras, she said. 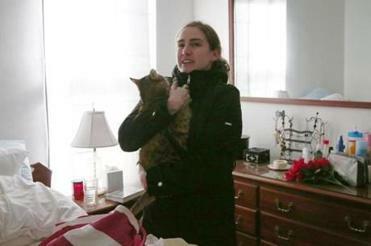 Cate Johnston was relieved to find her 10-year-old cat Pucha sitting on her bed. Later, when officials allowed her back inside 24 Berkshire St., Johnston found her apartment was “fine” and Pucha was sitting on her bed. “It was all I cared about,” said Johnston, her voice shaking with relief outside the building as she clutched Pucha in a bag against her chest. A few minutes earlier, another woman left a building with a bundle in her arms, ears poking out of it. As of Sunday afternoon, Warnick said he was not aware of any pets perishing. In addition to the city setting up centers for the displaced residents, Simmons launched the Mayor’s Fire Relief Fund to help the victims. By 1:30 a.m. Monday, a GoFundMe page had raised more than $250,000 with donations from almost 4,000 people. “We have to remember that it’s the holidays,” she said at the scene Saturday night. “We have so many families that are going to be touched by the tragedy, so we want to be sure that we are . . . here to lift up, protect, and comfort those that have been touched by this devastation.” Neighbors at the scene spoke consistently Sunday of how quickly and strongly the Cambridge community responded with heartwarming support. DuPont and Ribeiro will be returning soon with toys for the Bepari-Akter family: dolls for the daughter, Lego sets for the elder son, and trucks for the younger son. “Cambridge comes through for Cambridge,” DuPont said. Firefighters were still working the scene early Sunday. Globe correspondent Amanda Burke contributed to this report. Nicole Fleming can be reached at nicole.fleming@globe.com.